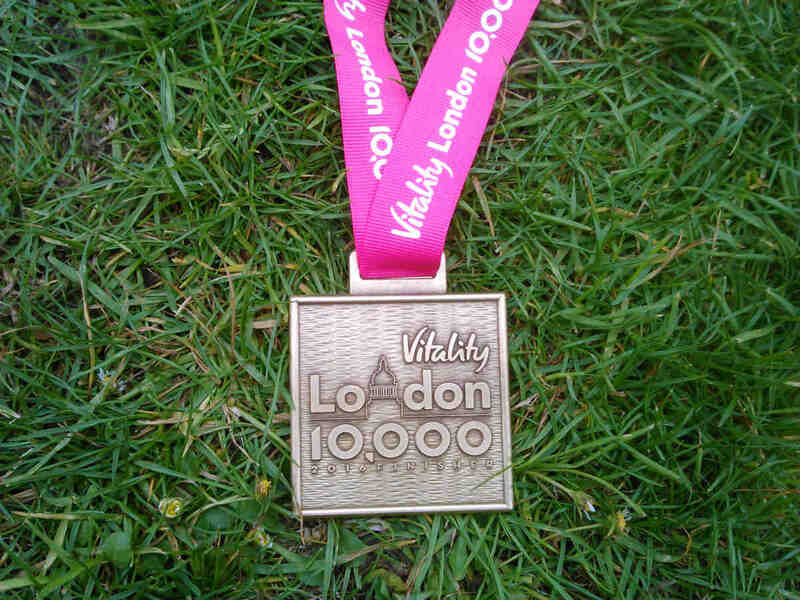 For me the London 10,000 was a tune-up race before my marathon in mid-June. This basically means that it was like a fast training run with the added benefits of a race. I am in a very good shape this season, all my races were successful — the Cambridge and Budapest Vivicittá half marathons, the Wings for Life World Run and the Waterbeach 10K. Therefore I had high expectations about the London 10,000, I wanted to finish in the top 5%. I have received the race pack about a month before the race. It included the race number with safety pins, the timing chip with wire twist ties, baggage bag and a booklet with information about the race. The background color of the race number showed the starting pen you were assigned to. The colors of the pens were, from first to last: black, blue, green and yellow. Being slightly color-blind I could not tell if my race number was black or blue, I had to ask somebody. It would have been better if they would have used a lighter blue color, instead of navy. I have found the booklet useless as it contained very little information about the race — and I have already read that on the website. It was full of advertisement about sport brands and charities. I had to travel to London from Cambridge. This was very easy as there are two-three trains every hour and I could sleep a bit on the train. 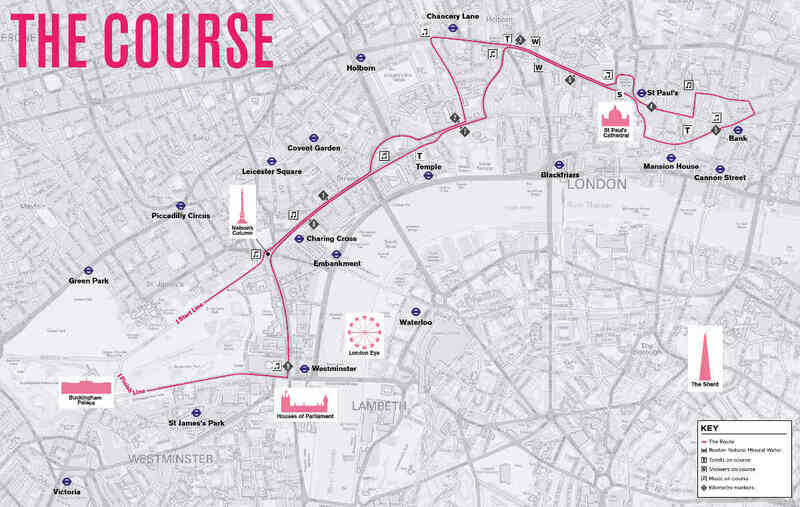 From Kings Cross station it is a ten minute ride on the tube to Green Park, the assembly area of this race. I have arrived at 8 o’clock, exactly two hours before the start. The park was still quiet, only a dozen of runners were there. The organizers were already working hard to set up everything. It was very easy to find everything in the park, changing tents, toilets, bag drop area, etc. I had plenty of time to prepare for the race. It was quite chilly and windy outside, so I have spent almost an hour in the changing tent. It took me a while until I tied the timing chip to my shoes. I really liked that the baggage bag was big enough to fit my bigger than average backpack. Dropping my baggage was an easy task. As everything else, this part of the event was very well organized, too. The bag drop area was about 100 meters away from the changing tent and it opened at 9 o’clock. It took me less than two minutes to get rid of my stuff. Luckily there were plenty of toilets, so people had to wait less then 10 minutes here. Then everybody headed to the start line. 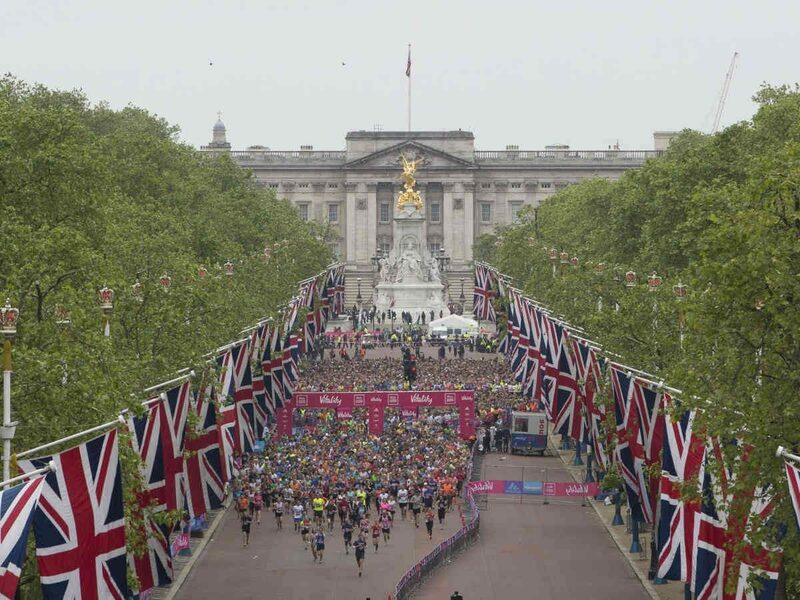 The start line was at The Mall, which is a very famous road in London. Although I know where it is and it is just a short walk from Green Park, things look very different when there are more than 10,000 people walking around. Still, it was very easy to find my starting pen as there were volunteers and huge signs and everywhere. I have arrived about half an hour before the start to my pen, the black one. This was the first one. Because we started in waves, the runners of this pen had their start at 10 o’clock, while the other pens started a few minutes later. The start area became very crowded in a matter of minutes. There were so many runners waiting for the start that for the last ten minutes we could barely move. At least we could listen to some good music coming from the loudspeakers. We had to walk about fifty meters to reach the start line and then we were off! The start line was a tricky one, because the road became very narrow just before it then broadened again. I didn’t really understand the logic behind it. Probably it reduces the density of the runners, so it is easier to run after crossing the start line. We started running towards the Admiralty Arch and Trafalgar Square. All I can remember from this part of the race is that it was crowded. Very crowded. Therefore it was hard to run, I had to constantly speed up and slow down. My bad vision was a big disadvantage in this situation, for me it was much more difficult to see all those people around me. But still, I run as fast as I could. However a lot of people overtook me on the first kilometer. After passing the first kilometer mark runners started to slow down. They have run too fast for the first few minutes. But not me, I felt great and full of energy and started overtaking others. This was a hard task. For the following two kilometers I was constantly looking for “tunnels” in the crowd and then I sprinted through it. There were a lot of turns on the route and I took advantage of them. Almost everybody tried to run on the inner part of the turn, leaving the outer part free. The crowd slowed down while I could sprint and overtook about a hundred runners at every turn. It helped a lot that the streets were full of supporters. This madness of constantly speeding up and slowing down continued until I have reached the 6 kilometers mark. If you look at the pace chart you can see what I am talking about. Usually long-distance runners want to run a race at an even pace, because that gives the best results. At this race my pace was varying between 3:00 and 6:00 minutes/km, which is far from an even pace. After completing two-thirds of the race I grabbed a bottle of water from a volunteer and poured it onto myself to cool down a bit. It surprised me how happy she became after successfully handing me the water — not an easy task at race speed. Although the route was flat, I am sure the second part was a slight downhill — which means the first half was uphill, something that I haven’t noticed. Running the last few kilometers was much easier, finally there was some space around me and I could run at the pace I wanted to. My GPS watch beeped at 39:02 minutes showing me that I have run 10 kilometers — so from now on this is my unofficial personal best. Sadly there were about 300 meters left until the finish line. Due to the fact that I had to overtake so many people and I couldn’t run on the shortest route possible, my race became quite a bit longer. The last kilometer we run along the St James’s Park, which was very beautiful. Also there was a huge crowd of supporters close to the finish line. I have crossed the finish line in front of the Buckingham Palace after running for 40:03 minutes. I was tired, but not exhausted, And happy. On our way back to Green Park the volunteers removed the timing chip from our shoes. Probably this was the most unpleasant work they had to do, messing with thousands of smelly running shoes. Then we received our goodie bag that included the finisher medal, a T-shirt, a bottle of water and sports drink, some food, leaflets and a tube of sunscreen. The last one from this list was a bit funny on that cold, cloudy and windy day as the weather felt more like winter than summer. I like the race medal, simple but nice. Would be even better with my finish time engraved on its back, but there was no such service at the assembly area. As everybody headed towards the bag drop area I had to wait a bit before I got back my backpack. The organizers and volunteers did a great job again! Walking around helped me to cool down a bit. Then I went to the changing tent, which was full of tired runners. There were no showers so everybody cleaned himself as he could, mostly with wet towels. The clean clothes and shoes felt good after my sweaty running gear. 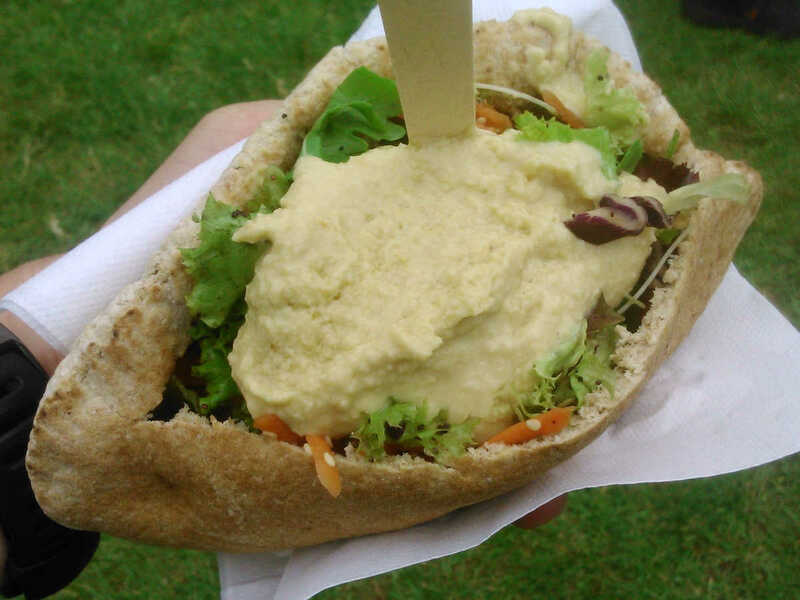 And then I have found the best food I have ever seen at an event or festival — wholegrain pitta filled with salad and topped with hummus. The salad was made out of 13 different vegetables. It was super delicious! In the land of burgers, chips and barbecues this healthy food was a real surprise to me. On my way home I met a good friend of mine in Hyde Park, Tünde, and we had a great chat. I have finished the race in 40:03 minutes in the 638th position out of 12,255 runners — top 5%. The data measured by my GPS watch can be seen on Strava.